Hard data about China that can only be termed startling keeps rolling in – and no one seems to be noticing. It’s data that shows China’s economy is in far better shape than the West generally believes. This has a number of investment implications. One of them is that a bull market in gold is getting closer. The data I’m referring to comes from an exhaustive study Bloomberg recently carried out analyzing China’s corporate debt. The study looked at 4,000 publicly traded Chinese companies, obviously a major chunk of corporate China. Financial companies were excluded from the study. That made sense since the strength of financial companies hangs on that of the companies they lend to. Bloomberg used a very basic measure to define corporate leverage: the ratio of total debt to EBITDA (earnings before interest expenses, taxes, depreciation, and amortization). A simple example shows why this ratio makes sense as a measure of debt. Suppose the ratio is 1. That means the cash you net before taxes and interest equals your entire debt load. It would be nearly impossible for a company to go bankrupt with a debt-to-EBITDA ratio of 1. So how does China shape up today in terms of its corporate debt? Between 2007 and 2016, the ratio for corporate China ranged from about 1.5 (in 2011) to a bit more than 2.6 (in 2007). In 2014, it was about 2.4. And in 2017, according to Bloomberg, the ratio fell to 1. That, clearly, should put to rest concerns about the level of leverage in China’s economy. 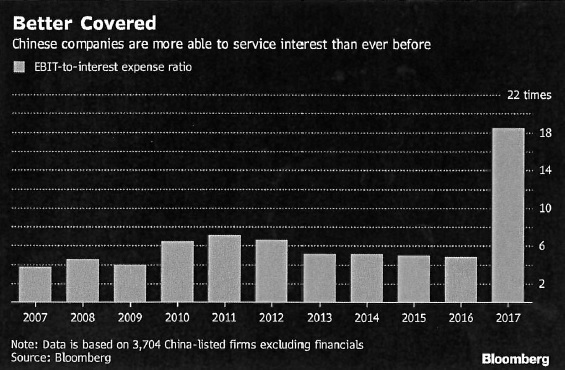 As the Bloomberg chart below shows, Chinese corporations have made huge strides in covering their debt expense with earnings. So if anyone – the IMF, a talking head on a cable financial news show, or your plain vanilla China bear – warns you that China is close to debt catastrophe, don’t take it too seriously. China, it seems, is in far better shape than they apparently want you to believe. There is, however, reason to worry about some debt – just not China’s. Using data supplied by Bloomberg, I did a comparable analysis of debt for companies in the S&P 500, again excluding financial companies. The results – the word “startling” again comes to mind – show the ratio is 3.06 for the S&P 500 on an unweighted-average basis. Using a weighted average (in which stocks count based on their capitalization) the number drops to 2.56, not a whole lot better. These results are stunning. They suggest – no, shout – that China is far less vulnerable in terms of debt than the U.S. But how can this be? After all, all the official record keepers, from BIS (Bank for International Settlements) to the IMF, tell you otherwise. Based on different measures that use GDP rather than earnings as the yardstick, they have issued reports assessing China’s ratio of corporate debt to GDP at about 160 percent, compared to less than 100 percent for the U.S.
Clearly you can debate whether it makes more sense to measure debt against earnings, as Bloomberg did, or against GDP. I think the earnings comparison is more meaningful. After all, companies won’t pay off debt with GDP but with earnings. But there’s likely another reason for the discrepancy. Realize that in bringing in China’s GDP as a measuring stick, the record keepers had to rely on figures supplied by China itself. And there’s good reason to believe that those figures understated China’s economy. The conventional wisdom in the West is that China likely overstates it GDP, and that its economy is weaker than it wants the world to think. Studies, though, suggest just the opposite: that China in fact probably understates the size of its economy. One of Xi’s primary messages in his three-and-a-half hour marathon address at the Communist Party congress in November was that China wouldn’t focus on growth for the sake of growth. Instead, it would focus on the quality of growth. The clear implication was that no official would be rewarded for overestimating growth. The latest examples of how China misleads on growth on the downside come from a paper published by the National Bureau of Economic Analysis. The three authors, two from the New York Fed and one from Columbia University, argued that careful analysis shows that China could be understating its growth and possibly by a lot. They looked, for example, at 2015’s fourth quarter, a time when much of the West believed China was at risk of economic collapse. China was reporting growth that was a shade under 7 percent. The West took that as an overstated figure that represented a blatant effort to project a falsely rosy picture. The authors’ conclusion? That the low end of China’s growth for the quarter was 7 percent – and that growth could have been as high as almost 11 percent. China has made such understatements for years. This makes it a near certainty that its GDP today is higher than it has stated. That throws light on why when you compare debt to GDP, the ratio for China comes out on the higher end. I.e., debt is being matched against a smaller economy than the one that really exists, which would misleadingly inflate the ratio. I began by noting that China’s economic strength has particular implications for gold. I will offer more details in a future article. The basic point for now is that China is continuing to take steps towards its long-term goal of a new monetary system centered on gold. The stronger and more solid its economy, the more ability it will have to succeed in this effort.